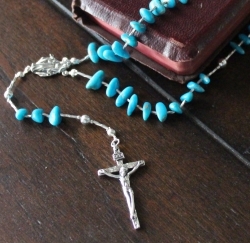 Native Americans are well known for their deep spiritual roots, and our turquoise crosses and rosaries embody that tradition. If you are interested in owning a truly unique, finely crafted work of wearable art, our crosses and rosaries are wonderful choices. All of our high-quality products are sourced locally from Hopi, Navajo, Zuni, and Santo Domingo tribes in New Mexico and Arizona, and many pieces are stamped with the official hallmark of the award-winning artists. 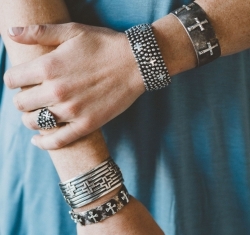 At Southwest Silver Gallery, we are committed to bringing you only authentic pieces. All of our jewelry is meticulously handcrafted by world-class artists who are genuinely passionate about jewelry making. Our Native American cross jewelry and rosaries are made from only genuine materials, including .925 sterling silver, turquoise, onyx, garnet, topaz, gaspeite, and more. We even have multi-gemstone inlay offerings if you can't choose just one. While traditional Native American jewelry was certainly used to adorn the body and decorate the home, it had other purposes as well. The ancient tribes refined their skills year after year, passing down techniques to their children for centuries. Over time, different tribes became known for their unique styles, and many are still world famous today. In fact, jewelry is often strongly highlighted in museums that have Native American exhibits. If you are fortunate enough to admire American Indian jewelry up close, you will see just how much skill and effort goes into each piece, and our Native American cross jewelry is certainly no exception. You have probably noticed that turquoise is featured in many of our Native American crosses. The ancient Native Americans relied on this blue-green mineral as a currency and as a form of collateral, but it meant so much more to them than that. The story of the origin of turquoise says that the Native Americans desperately needed water during a period of drought, and when the sky finally blessed them with rain, their tears of joy washed into the Earth, and turquoise was born. As you might assume from the legend of the stone's origin, turquoise was treated as a supernatural substance. In households, it was common to see bags of turquoise hanging to keep misfortune away. Burial grounds were often surrounded with turquoise to protect the inhabitants. Much like gold, turquoise was regarded as a symbol of fortune, wealth, prestige, and power. 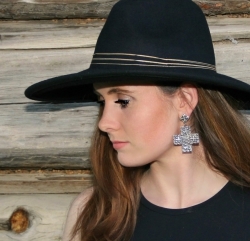 Owning our Native American cross jewelry is a great way to celebrate the fascinating traditions of times gone by. As a family-owned business, we recognize the value of each and every customer, and that is why we go to great lengths to guarantee your satisfaction. If you have any issues whatsoever, we will happily offer a full refund or exchange within 30 days, with no questions asked. All of our products include a certificate of authenticity and complimentary gift wrapping. If you have any questions, we encourage you to call our friendly and helpful customer service team at 1-888-476-4367, or you may send us a message here. Add a beautiful, elegant work of art to your jewelry collection today.